This message will help you learn how to get past devastating things in your past, and how to have joy even when God’s plan for you in the present is excruciating. When God’s plan for you is hard, learn the difference between standing in front of the train and getting on it. 1We have been studying verse by verse through the Sermon on the Mount and we are about half-way through, which puts us right in the middle of the Lord’s Prayer. The Lord’s Prayer is an outline for prayer, so each phrase opens to us an entire category of prayer. So we are devoting one sermon (or so) per phrase. Last week we looked at the third request – Your will be done on earth as it is in heaven. We found that there are a couple different ways Scripture uses the word “will.” Sometimes it means will in the sense of desire, and other times it refers to the will of decision. And of course there is some overlap. There is a reason why the same word is used for both concepts. But last week I tried to make a case from Scripture that the distinction between will of desire and will of decision is a biblical one. “Your will be done on earth as it is in heaven” has to be talking about the will of desire, because the will of God’s decision – His perfect, unchangeable plan - is already done on earth as it is in heaven. So the prayer for God’s will to be done means to desire what God desires. And what God desires is revealed in His Word. Every command in the Bible is a window into the heart of God revealing His will of desire. 1 Thessalonians 5:18 give thanks in all circumstances, for this is God's will for you in Christ Jesus. 1 Peter 4:1 he who has suffered in his body …2 does not live the rest of his earthly life for evil human desires, but rather for the will of God. God’s will is the opposite of sin. Doing God’s will is the same as righteousness because it is exactly the same thing as obeying God’s commands. The agnostic says, “How could puny little man ever know what is on the mind of God?” Simple – God revealed it. Man is not capable of figuring it out, but God is fully capable of revealing it, and He has done so in the Bible. And if we see God’s commands as windows into His heart it totally changes the meaning of obedience. Obedience is doing what God desires in His heart. Jesus castigated the Pharisees because they followed the letter of the law in technical ways, but they did not care at all about what God actually wanted. They got so caught up in arguing about what was allowed and what was not allowed that they forgot about what God actually wanted. Imagine you owned a business, and you gathered your employees together one day for a big meeting and said, “I’m going to be out of the country for several months. While I’m gone, here’s what I want done…” And then you gave some detailed instructions. While you are gone your employees respond in different ways. One of them makes a list of every statement you made in the meeting. He finds all the ones where you used the same word or a similar phrase and puts them together into paragraphs. And his paragraphs are ingenious and fascinating, but they do not really reflect what you wanted done. In fact they bear a striking resemblance to that employee’s philosophy and ideas. Another employee decides to memorize every word you said. He never shows up at work, because he is spending all his time at home working on getting it word-for-word. Another employee is a lawyer, and he combs through the transcript of the meeting and finds numerous loopholes in what you said. And he uses those loopholes as an excuse not to do any work. Another employee goes the opposite direction. He takes some statements that you intended in a general way and makes them absolute. For example at one point in the meeting you said, “Take care of the customer.” So this employee never shows up for work either because he is going to customer’s houses and mowing their lawns and going into their homes to do housework for them. And then you have a couple employees who just show up at work every day and do what they know you want done. They are the only ones who did your will. Obedience is not about matching your actions to the letter of the law, but rather about finding out what pleases God and doing that. The reason the United States legal code is so complicated that you need a lawyer to do the simplest contract is because for over two hundred years Congress has been writing laws, and attorneys have been finding loopholes. Then they write laws to cover the loopholes, and they find loopholes in that new language, and it never ends. It is impossible to write a law in which the language covers every possible situation. So in the Bible God does not even bother with that. He just gives general principles that reveal His will and then calls us to do what He desires. And there are no loopholes in that. The more a relationship is based on love the more ridiculous it is to think in terms of loopholes. If your wife called you in a panic and said, “I just heard breaking glass downstairs. I think somebody broke in and he’s in the house! Please come home right now!! !” But you are very busy and have a lot to get done at work. So you get in the car, drive home, pull into the driveway, then back out and drive back to work thinking, Technically I fulfilled what she asked – I came home. You found a loophole – she did not say anything about coming inside and protecting her. You might use that kind of thinking with the IRS, but not with your wife because your relationship with the IRS is a legalistic one and your relationship with your wife is a relationship of love. Legalistic relationships are all about laws and loopholes. Love relationships are all about being moved to fulfill the will and desires of the one you love. The Pharisees had a legalistic relationship with God. But Jesus taught that unless your righteousness exceeds that and rises to the level of a love relationship, you will never even enter the kingdom of heaven. This is why those of us who take the Bible seriously are so big on what is known as authorial intent. That phrase simply refers to the belief that every passage of the Bible means whatever the author meant to communicate and nothing else. When Moses wrote Genesis 1 about the creation, he had a certain message he was trying to communicate to the original readers under the inspiration of the Holy Spirit. Whatever that message was, it still is. It will never change. Modern science has zero effect on what Moses meant. It does not mean something different when a person in a different culture reads it. A passage can never mean what it never meant. When people have a Bible study where they read a passage and they go around the room asking “What does this passage mean to you?” every single person in the room should give the exact same answer. And if they do not, then someone is wrong, because it means whatever the writer meant and nothing else. If you signed a contract involving your life savings, and someone came along and changed your words to mean something different from what you intended, you would not like that. For example, you would not want them to take the number six and make it a million. It is wrong to do that with the words of other people and it is really wrong to do it with the words of God. Scripture means what the author meant and never anything else. As evangelicals our whole method of interpreting the Bible is based on loving God’s will. Caring about what He really wants. Our whole method of interpreting Scripture is focused around discerning the author’s intent to the best of our ability, because we are governed not by laws and loopholes but by love for God and His will. The liberals change what God said to fit their beliefs. The legalists look for loopholes so they can behave the way they want. So in the final analysis the liberals and the legalists are the same. Even though it seems like they are opposites, they are both doing the exact same thing – preferring their own will over God’s will – and jerking God’s words around to try to support what they are doing. But lovers of God just want to know what God meant by what He said because whatever it is He meant is His will and is therefore wonderful and good and to be preferred over our own ideas. Where does our own will get us? Our will seems so right and it is so important to us, but where does it get us? What great rewards did we ever get from choosing our will over God’s? Adam and Eve wanted knowledge so bad, they preferred their own way over God’s. And what did they get out of it? They forfeited paradise and life and what did they get? They got to find out that they were naked. Saul preferred his will over God’s and forfeited the entire kingdom for what? A few sheep and cattle. Judas said, “My will be done” and forfeited Apostleship and eternal life – for what? The payoff he got proved so unsatisfying he threw it away and committed suicide. Our own will seems so attractive. It is so important to us. We want it so bad. God’s will is to love your wife and your will is to leave your wife and your way just seems so much better. God says confess your sins, your will says cover it up with a lie and it just seems like your way will work out so much better than God’s. We cling to our own will, and what does it ever gain for us? Look back over your life – isn’t it true that misery generally attends preferring your own will? And haven’t your times of greatest joy been when you have preferred God’s will? Even though it seems like you lose in the short term when you prefer God’s will, in the long term you will never suffer loss by doing God’s will – only gain. So all that is to kind of round out our thoughts from last week about God’s will of desire. But before moving on to the next phrase I think we should take a little time to consider the other side of this - God’s will of decision. God’s will of decision is when God decides to do what is best and does it – even if it is something He does not enjoy doing on the surface. Like when God decides the very best thing that could happen to you right now is for you to lose your job. God does not enjoy taking your job away. He delights in what He is accomplishing, but He does not like watching you go through the painful cycle of emotions that go along with being fired. He has infinite love for you which means He must have infinite pain when He watches you suffer. However He decides to do it in cases where it is absolutely the best thing for you and the benefit for you is so massive that it is easily worth the suffering, and cannot be attained any other way. Just like when you discipline your children. You do not like doing it, but you do it anyway because it is the most loving thing. That is the will of decision. How should we respond in those times when we are called not only to submit to God’s will, but to suffer God’s will? The answer is in Luke 22. The cup refers to all the suffering of the cross. So Jesus teaches us by example what do you do in those times when what you want collides with what God has planned. We need to know that because it happens every single day, doesn’t it? Tomorrow morning the very first thing that happens to you in your day might be that by God’s plan morning will arrive WAY before you are done sleeping. Your will of desire was that you would sleep well and wake up rested, but His decision was that you lie awake all night and find yourself dead tired in the morning. Your will of desire is a hot, tasty breakfast. His decision might be burnt toast. Your desire is a smooth day at work; His decision might be a day governed by Murphy’s law. Or at a deeper level – your desire was to get married and have a house full of kids. His decision so far is for you to be single. Last Monday a very dear brother in Christ whom some of you know was driving home from a hunting trip. His kids are my kids’ age so I am guessing he was in his 40’s. His wife and kids’ desire was for him to make it home safe. God’s plan was for him to be killed in an accident. I am not talking only about trivia here. Sometimes God’s plan is excruciating. How are we to respond when our will of desire collides with God’s will of decision? The first step is to remind yourself why there is a conflict. Isaiah 55:8-9 “my thoughts are not your thoughts, neither are your ways my ways," declares the Lord. 9 "As the heavens are higher than the earth, so are my ways higher than your ways and my thoughts than your thoughts. The reason His ways are different from my ways is because His ways are higher. “Higher” means greater, more important, better, wiser, superior. If you and I disagree, maybe I am right; maybe you are right. But when I desire one thing and God decides to do something else it is always because my desires were low and His were high. What I wanted was less good, less beneficial, less profitable, and His decision was higher and greater. No one in this room has ever had a thought that was higher than any one of God’s thoughts. That is why Jesus loved to do the will of the Father. Thomas Watson said: “Jesus went more eagerly to the cross than we to the throne of grace.” Why was Jesus so determined to set His face toward Jerusalem and go to where He knew He would be brutally crucified? Because He knew it was His Father’s will, and whatever the Father wanted, He wanted. Matthew 26:42 He went away again a second time and prayed, saying, "My Father, if this cannot pass away unless I drink it, Your will be done." And I realize it sounds like I am up here stating the obvious, but we need to hear this because there are some times when our desires seem really, really high. For example, the desire that your children or your spouse would be saved. That is a high, high desire. I am not talking here about low desires – the desire to go out and get drunk or something. We have some very good, very high desires, and it can seem sometimes like it is just impossible that what actually ends up happening is higher and better than what we desired. Matthew 16:21-22 Jesus began to explain to his disciples that he must go to Jerusalem and suffer many things at the hands of the elders, chief priests and teachers of the law, and that he must be killed and on the third day be raised to life. 22 Peter took him aside and began to rebuke him. "God forbid it Lord!" he said. "This shall never happen to you!" Peter did not like the idea of the Messiah being murdered on a cross by a bunch of wicked hypocrites. That sounds like a pretty high desire to me. And Peter was passionate about it. He pulled Jesus aside and began to rebuke Him. But just because you passionately believe something with all your heart does not mean it is best. Jesus’ response to Peter is devastating. Peter was trying to hinder Jesus from going to the cross and Jesus said, “Get behind Me.” In other words, “Get out of my way, Peter.” That sounds harsh, but in one way it is actually merciful. Most unstoppable forces do not give you a chance to get out of the way. Avalanches and hurricanes just plow through whether you are standing there or not. The Son of God is an avalanche. He is a freight train – He is going to the cross – period. He allows Peter the chance to get out of His way first, but not without rebuking Him with what has to be the harshest thing He ever said to a Disciple. He calls Peter Satan because Peter had the things of men in mind which is the same as having the things of Satan in mind. You do not ever want to find yourself resisting God’s plan. Standing in front of a train and trying to resist is always a bad idea. Get out of the way. When your desire does not match God’s decision do not resist. In fact, your best bet is to just get on the train. God’s plan is not subject to change. It can be resisted or submitted to, but not stopped. You can get on or get run over – that is it. So stop resisting, climb aboard, buckle up, and just let the perfect plan of God carry you along. And if you want one word for all that it is “submission.” Most people do not like the word submission because they think it means letting the train run over them. It does not. It means getting on board the train. Saying, “Your will be done” is not a bitter resignation. We are not saying uncle. We are saying, “God, if this is where this train is going I on want to be on board because there is no doubt in my mind that You know what You are doing.” So our submission is always a glad embracing of God’s will. As a side note – I think understanding that would help a lot of wives who chafe under the idea of submitting to their husband. The husband’s will is not exactly a train – it is more like a bicycle. A bicycle you can sometimes stop by resisting it. But wives, true submission is not lying down and letting the bike run over you. It is climbing on the other seat of a tandem and helping peddle while he steers. So what do we do when God’s decision is contrary to our desire? First, remind yourself that His ways are higher, and second, submit. Climb on board the train. I think “Your will be done” has to be one of the most un-meant prayers there is. How many times do we say, “Not my will but Your will be done” when in reality we would still prefer ours over His? We will say “uncle” if we have to, but deep down we are not really on board. I will never forget the first time this truth really hit me. I was a teenager, and I lost my wallet – with about $300 of cash in it that I had recently earned. I had looked everywhere except my room. If it wasn’t there then it was for sure lost. So before looking I knelt down and prayed and said, “Lord, if there’s any possible way this can fit into Your perfect plan, let it be in my room. But if it’s not possible for that to fit into Your perfect plan, don’t let me find my wallet – let it stay lost.” I had prayed that way many times, and I had many times taught others to pray that way. But this time the reality of it just hit me. When I said, “If it’s not best, then don’t let me find the wallet” I thought, Do I really mean that? Do I really believe that it would be better for me not to find my wallet right now than to find it if that is God’s plan?” And at that moment, by God’s grace, I did. I realized what a terrible thing it would be for me to find that wallet if it were outside of God’s perfect plan. So I got up and searched every nook and cranny of my room and could not find it. Never did find it. And I can tell you when I got done looking and realized it was not God’s plan for me to find it, I was genuinely happy. I found myself back on my knees thanking God for preventing me from finding it. I was so glad to be in the care of a Father who would do that sort of thing for me when needed. I was so glad that I did not have to worry about whether the best thing was happening to me. It was such a relief! I wish I could stand here and tell you that I always do that when I get hard providence, but that would be a lie. I forget this principle one hundred times a week. And I ask your forgiveness for all the times I have not modeled this truth. But I can tell you from occasional experiences that it is a blessed truth, and is a path to unassailable joy that cannot be touched by any loss. So ask yourself, How do I respond to the Matthew 16’s of my life? What happens in your heart when God’s plan is different from your desire? Complaining? Discontent? Fretting? Anxiety? Anger? Or do you bow the knee to the One who sent this calamity and say, “Yes, Lord”? That is what Jesus did. When Peter tried to prevent His arrest He said, “Shall I not drink the cup the Father has given me?” (Jn.18:11). Is that your attitude when hard providence comes your way – big or small? Sometimes we do better with big suffering than with small suffering. You lose a loved one and you embrace all these attitudes. But what happens when you stub your toe on something that some knucklehead left laying on the floor? Or you cannot find your car keys and you are late? Or your computer crashes and you lose all your work? What comes out of your mouth? Grumbling? (“Darn it! …”) Or do you say, “Shall I not drink the cup my Father has given me? Shall I accept good from the Lord and not trouble? 1 Peter 5:6 Humble yourselves under the mighty hand of God, that he may lift you up in due time. If He strikes us down we lie at His feet and say, “Your will, not mine be done.” And He will lift us up in due time. “But I just need to know why?” No you don’t. The great thing about the will of God is we do not need to know the reasons for it in order to love it. We only need to know that He is our Father and He is good. How should we respond to God’s will when it hurts? Acknowledge it as higher, then submit – climb on board the train, and then, when possible, seek relief. When Jesus prayed in the garden He said “not my will but your will be done,” but He also said, “Father, if it be possible, let this cup pass from me” (Mt.26:39). In His human nature Jesus did not know for sure if it would be somehow possible for God to do this another way. And so He asked. We accept what has already happened, because that is clearly God’s will of decision. But we are not passive or resigned or indifferent about the future because we do not know for sure what God’s plan is for each circumstance. If you get cancer then you know it was God’s perfect plan for you to get it, but you do not know for sure if it is His perfect plan for you to continue to have it, so there is nothing wrong with asking God to heal you. When Timothy got sick Paul did not tell him, “Just deal with it – it’s God’s will.” He told him, “Take something for your stomach.” If there is something you can do to find relief, that is fine – if you can do so without violating God’s will of desire. So if God gives you a headache it is OK to take some aspirin. But it is not OK to get drunk. If your spouse is driving you crazy it is OK to seek counseling. But it is not OK to divorce. As long as you remain inside the will of God it is fine to seek to bring about changes in your circumstances. OK, so Jesus has taught us how to address God – Our Father who is in heaven. He has taught us to pray first and foremost about His name – that it would be hallowed and honored and revered. Next He taught us to pray for His kingdom – that there would be more obedience to Christ here and now, and that the final form of the kingdom would arrive soon. Then He taught us to pray for His will – to desire what He desires and to subordinate our will to His. And now, after all that, we are finally ready to give our personal requests – our daily bread. If the structure of the Lord’s Prayer teaches us anything let it teach us priority. Let it teach us that prayer is about God. I need to start by praying about His name and His kingdom and His will – His honor, His desires, His purposes; so that I will understand why I am asking for whatever it is I am asking for when I get to my personal requests. If I start out the way Jesus taught us these past few weeks I will know that there is only one reason to pray for daily bread. The only reason to pray for provision is so I can carry out my part in His kingdom. If I ask for daily bread just so I can be comfortable, that is worthless. But if I pray for daily bread so that I can function in the work of bringing about His kingdom and bringing people to hallow His name and do His will – that is a prayer He delights to answer. Kingdom praying reminds you that you are on a ship, and the purpose is to get to the port. If we get sick we ask the captain for some medicine. And he says, “Why?” and we say, “Because I want to be well enough to hoist the sails” (or repair the rudder or feed the crew or whatever we can do to help get this ship to port). We do not pray for healing just so we can wander aimlessly around the boat or hit golf balls off the deck. So kingdom praying teaches us the right motive for our personal requests. In fact, in some cases it changes what your request ends up being, because it reminds you of the kind of God you are speaking to. In Acts 4 the people are in a world of trouble. Peter and John had been captured and beaten, and then commanded to stop preaching. And that was not an idle threat – it came from the mouths of the very same people who had just brutally murdered Jesus. This is a scary situation to say the least. And so they pray. And you might expect something like, “God help us! Protect us! 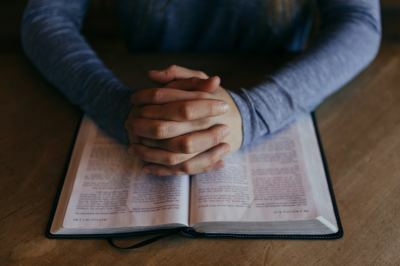 Give us wisdom and guidance – show us what to do…” But instead they follow the pattern of the Lord’s Prayer and begin with a focus on God and His kingdom and power and will. Listen to all the “you’s” in this prayer. Acts 4:24 "Sovereign Lord," you made the heaven and the earth and the sea, and everything in them. 25 You spoke by the Holy Spirit through the mouth of your servant, our father David: "'Why do the nations rage and the peoples plot in vain? 26 The kings of the earth take their stand and the rulers gather together against the Lord and against his Anointed One.” 27 Indeed Herod and Pontius Pilate met together with the Gentiles and the people of Israel in this city to conspire against your holy servant Jesus, whom you anointed. 28 They did what your power and will had decided beforehand should happen. 29 Now, Lord, consider their threats and enable your servants to speak your word with great boldness. 30 Stretch out your hand to heal and perform miraculous signs and wonders through the name of your holy servant Jesus. Two thirds of the prayer is worship, the last third requests, and no doubt the first part had a huge effect on the last part. After praying about God’s promises in Psalm 2 and His sovereignty over their enemies, suddenly protection was not their greatest desire. And wisdom and guidance were not really the issue either – because what they needed to do at this point was crystal clear. What they needed was simply boldness to go do it. Focusing on God first in your prayer changes what you end up praying for. In Jeremiah 32 siege ramps were being built against Jerusalem. The Judeans are about to be slaughtered by their enemies, and Jeremiah cries out in prayer. But he begins by focusing on God. And it goes on like that all the way down to verse 26. And do you know Jeremiah never does get around to making a request? By the time he gets through talking about God he does not even feel the need to make a request. This will change what you pray for. You will not just immediately ask for the greatest comfort all the time. And in those rare cases where getting your daily bread will not do anything to further God’s kingdom – you will not even ask for daily bread. Jesus showed us that. His heart was troubled. And normally when your heart is extremely troubled your tendency is to just burst into God’s presence asking for deliverance. “Save me from this hour, God!” But if you stop for a moment to consider God’s kingdom, and the highest, most compelling drives of your heart are for that, and you can see that this suffering is playing an important part in the advancing of the kingdom – you suddenly lose the desire to say, “Save me from this hour.” Instead you say what Jesus said, “Father, glorify Your name!” Why? Because the hallowing of God’s name and the working of His purposes are more precious and delightful to you than your own relief from suffering. Please do not ever think the first half of the Lord’s Prayer is to butter God up so He will say yes to our requests in the second half. No. The purpose is not to butter God up; it is to open our eyes to God. When you have been in the dark for a long time and then walk out into the sunlight, at first it is so blinding you cannot see anything. You have to take a few moments to let your eyes adjust so you can see in the light. And it is the same way with prayer. Living in the physical world we so easily have our gaze downward in this dark world, so when we first start praying it takes a few minutes of focusing on God and His glory and His kingdom and His will before have any kind of perspective to ask for what we should ask for. But when things do come into focus and we are ready to ask then our asking and His answering becomes an exceedingly precious exchange, and we will plan on looking into that next time. Benediction: Hebrews 10:32a, 35-39 Remember those earlier days after you had received the light when you stood your ground in a great contest in the face of suffering…35 do not throw away your confidence; it will be richly rewarded. 36 You need to persevere so that when you have done the will of God, you will receive what he has promised. When Jesus says not my will is He talking about His will of decision or His will of desire? It is His will of desire. Jesus’ decision was to go to the cross. His desire was not to have to go through that. And when He says, “your will be done” is that the Father’s will of desire or decision? Decision (the Father did not gain enjoyment from punishing Jesus on the cross). Matthew 16:22. This translates a Greek idiom that would literally be translated as “mercy to you.” The idiom is an ellipsis that means something like, “May God have more mercy than that on you, so you wouldn’t undergo such a terrible thing.” In essence it ends up meaning much the same as our idiom “God forbid.” In both case the idiom calls upon God to prevent the bad thing from happening. Steve Viers, “Responding Properly When God’s Plan Differs from Your Own” p.9.